Shishito peppers are delicate and grassy, with barely a bit of spice to them. You can simply sautée them, but we think they're significantly better if you blister them. What's the difference? They both involve a hot frying pan and a bit of oil, but blistering peppers means letting them sit a bit and blacken, whereas sautéeing implies that you're moving them around a lot to keep just that blistering from happening. Take it easy, bring out their best flavor, and let these peppers blister a bit. 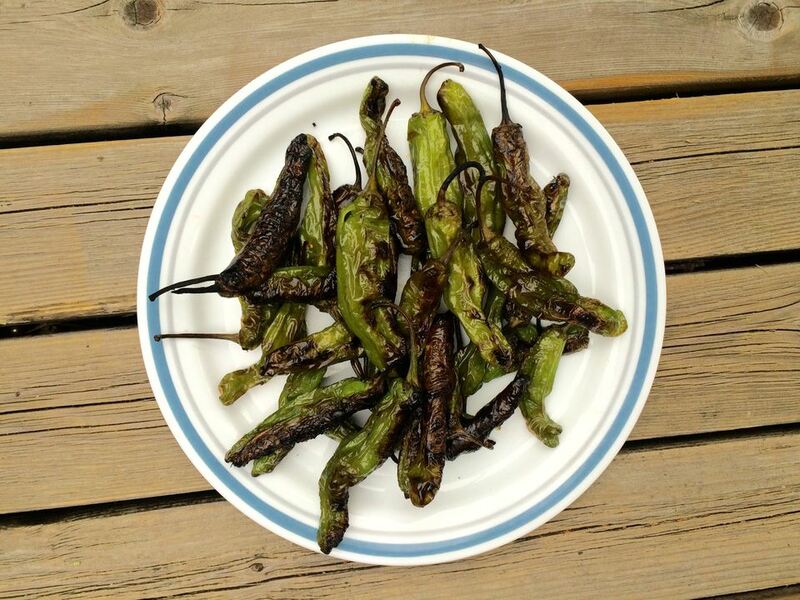 Have Padron peppers on hand? Check this out. Rinse the peppers clean with cold water and pat them thoroughly dry with paper towels (you really want them dry as in d.r.y.). Heat a large frying pan over high heat (the pan should be large enough to hold the peppers in a single layer). When the pan is hot, add the oil. Swirl the pan to coat the bottom with the oil. Add the peppers. Your instinct may be to stir them or shake the pan; just let the peppers sit and sizzle until blisters form on them (the skin should pop away from the peppers a bit) and they've started to softened, a few minutes. When the peppers have started to blister just a bit on that first side, then stir them around and mix them up. Let them sit for another round of blistering. Repeat until peppers are soft, blistered on the outside, and just starting to get some black spots on them, about 10 to 15 minutes total. Transfer the peppers to a plate or serving platter and sprinkle with salt to taste. Serve immediately. Want to mix things up? Sprinkle the peppers with lemon juice, chopped herbs, or toasted sesame seeds.